New commemorative Polish stamps appeared during 1919. The most important events of this period celebrated peace and the re-emergence of Poland's national identity. The seven commemorative Polish stamps (Sc. 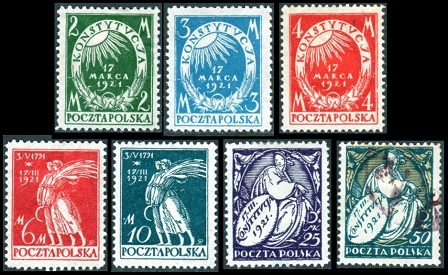 #133-139) shown above were issued during 1919 and 1920 to celebrate the First National Assembly of Poland. They were printed on wove or ribbed paper, and they were perforated 11 1/2. 10 F. (1919) - Polish heraldic eagle. 15 F. (1919) - Ignacy Jan Paderewski (1860-1941), a Polish pianist, composer, politician, and spokesman for Polish independence. He was the first prime minister of the Republic of Poland. 20 F. (1919 - Size: 21 x 25 mm) - Adalbert Trampczynski (1860-1953), a Polish lawyer and a politician of the National Democratic Party. He was the governor of the Poznan province during 1919, and he served in the National Assembly and the Senate of the Republic of Poland from 1919 to 1928. 20 F. (1920 - Size: 17 x 20 mm) - Adalbert Trampczynski. 25 F. (1919) - General Josef Pilsudski (1867-1935), a Lithuanian-born Polish statesman and military leader. He was the Chief of State from 1918 to 1922, the first Marshall of Poland from 1920, and the Minister of Military Affairs from 1926 to 1935. 50 F. (1919) - Polish eagle watching a ship. 01 M. (1919) - Griffin. The National Assembly of Poland (Polish: Sejm, English: Diet) is the publicly elected lower house of the Polish parliament, similar to the UK House of Commons or the USA House of Representatives. The upper house of the Polish parliament is called the Senat (English: Senate). The First National Assembly of 1919 passed a new constitution, which established a parliamentary republic and proclaimed the assembly's sovereignty. The three commemorative stamp designs (Sc. 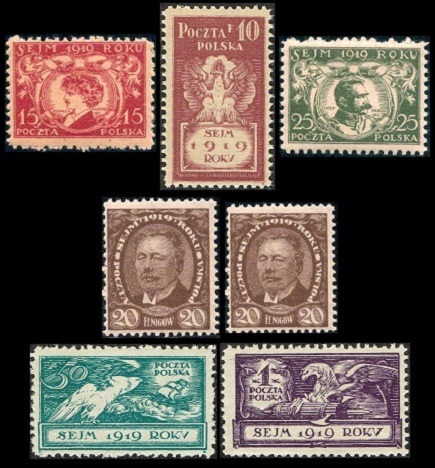 #154-155A) shown above were issued during 1921 and 1922 to celebrate the Signing of the Treaty of Riga on March 18, 1921. They were printed on thin to thick, wove or laid paper, and they had varying perforation measurements, ranging from 9 to 14. The design features a Sower and the Rainbow of Hope. The 20 M. denomination stamp was issued in two formats. The design of the first format (Sc. #155A), issued in 1921, measures 28 x 22 mm. The design of the second format (Sc. #191), issued in 1922, measures 25 x 21 mm. The Treaty of Riga was the peace treaty between the Republic of Poland and the USSR, following the end of the Polish-Soviet War of 1919-1921. The treaty established a permanent Polish-Soviet border, which would remain unchanged until the beginning of World War II. The seven commemorative Polish stamps shown above (Sc. #156-62) were issued on May 2, 1921 to celebrate the New Constitution of March 17, 1921. These stamps had varying perforation measurements, ranging from 11 to 13. 01 M. - 04 M. - Sun breaking into darkness. Allegorical representation of peace rising from despair. 06 M. - 10 M. - Allegorical representation of peace and agriculture. 25 M. - 50 M. - Allegory of peace. This new constitution, called the March Constitution, was based on the French constitution, and it was considered very democratic. The constitution forbade racial and religious discrimination. It also abolished all royal titles and state privileges. The three Polish stamps (Sc. #192-194) shown above were issued during 1923 to commemorate the 450th Anniversary of the Birth of Nicolaus Copernicus and the 150th Anniversary of the Death of Father Stanislaus Konarski, along with the Creation of the Commission of Public Instruction by the Polish parliament. These stamps had varying perforation measurements, ranging from 10 to 12 1/2. 1,000 M. - Nicolaus Copernicus (1473-1543), the famous Polish mathematician and astronomer, responsible for formulating the heliocentric theory. The theory states that the Sun is the center of our planetary system, and not the Earth. 3,000 M. - Father Stanislaus Konarski (1700-1773), a Polish pedagogue, poet, dramatist, political writer, and educational reformer of the Age of Enlightenment in the Polish-Lithuanian Commonwealth. His educational reforms became a landmark in the 18th Century struggle to modernize the Polish education system. 5,000 M. - Nicolaus Copernicus (1473-1543).